The F-4AF Pro System Bag by Domke is a 'shooter's bag". With its four pockets and two removable inserts, you can store all the ear you need for a light assignment. The camera can be stored in shooting position so that when the shot presents itself, all you need do is open the bag, grab the DSLR, shoot and move on. Aside from a camera and zoom lens, the padded inserts will hold extra lenses as well as a larger strobe. The F-4AF is constructed from cotton canvas and open cell foam on the bottom while the fabric itself is treated with a special formula that protects it from weather. The fabric is breathable and will take on an aged look of its own after numerous uses. The included refinishing wax will bring the bag back to its original patina. For portability, there is an adjustable, non-slip Domke Gripper Strap as well as a removable hand strap. The reputation of Domke Bags is well-known. Domke bags have graced the shoulders of photojournalists from all the four corners of the planet. They are renowned for their durability, functionality as shooting bags and ease of use. 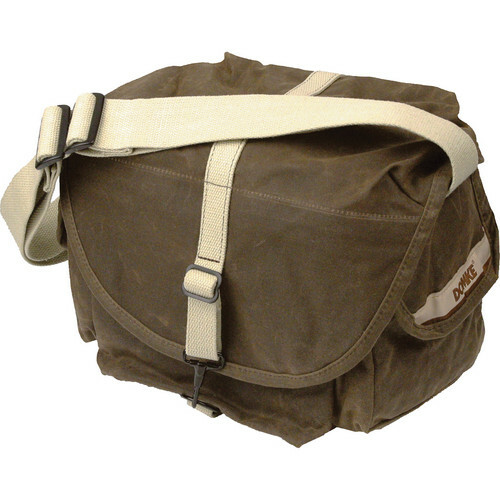 For pro or amateur, this is a rugged, and formidable choice for a bag when you need something that will last. Box Dimensions (LxWxH) 13.6 x 11.2 x 7.4"
F-4AF Pro System Bag Ruggedwear (Dark Khaki) is rated 4.2 out of 5 by 9. Rated 5 out of 5 by Kathy and Ralph from Awesome Bag Asthetically pleasing to look at. Much more roomy than expected. Can fit more accessories than originally purchased for, which eliminates crowding. Quick connects are nice...durable metal instead of plastic. Will be purchasing one as a gift for father who is amateur professional photographer. Rated 4 out of 5 by cm74 from Nice little bag Works well when I don't need more than 1 or 2 lenses, and I'm going to be carrying my camera out all day. With Nikkor f/2.8 lenses (I have the 14-24mm, 17-35mm, 28-70mm, and 70-200 VR) I can't fit more than two. And I can't fit my D700 (with MB-10 grip) with lens attached. With slightly different dimensions and maybe different internal divider configuration, this might work better for larger pro-sized bodies and lenses. But if all I need to do is take a couple of lenses with me (plus small accessories and a flash, if necessary), this bag is fine. Rated 2 out of 5 by Anonymous from To small Overpriced, small for a Nikon D5 with 24-70 and another lens like 70-200. Nothing spectacular at this surprising common bag. Rated 2 out of 5 by deadhorse from too small Durable but don't care for the way the top fits the bag and definately too small for an fx camera with a lens. Rated 5 out of 5 by Anonymous from Just what I needed Lives up to the Domke reputation. Good quality and functionality. Plenty of room for large SLR body, 3 lenses, and a flash. Does not look like a camera bag at first glance so is perfect for traveling discretely. I hope I get years of use out of this bag as I hear most do with their Domke bags. Zippers on some of the exterior pockets would be a bonus. Rated 5 out of 5 by Lorie from Love This Bag I was looking for a bag that I could use to carry around my Nikon D3s with the 85mm attached and still have room for another lens or two and this works well for me. I took out the extra padded compartments in order to accomplish this, but being able to fit the camera in with the lens on was the most important aspect for me and I rely on the heavy canvas and padded bottom to protect my equipment. I like the look of the bag - it folds around your body and gives a relaxed broken in look that is not so camera equipment obvious. I like the weight of the material, the design and the overall quality. If I was putting my camera in the truck of a car with other things this is not the bag I would use, but for carrying around and working out of the bag I find it to be excellent. The extra pockets are large and easy to get into as well. Overall I'm extremely happy with my choice and would recommend it to anyone who has the same criteria. I would have liked to have the option of paying less for the bag and not having the padded inserts. Rated 5 out of 5 by Anonymous from Great bag I am a pro wedding photographer and have used Domke bags for over 20 years. I really like this bag because I can put my camera in it, with lens and flash attached, and be able to grab it in an instant. Good looks with lots of storage pockets. Rated 5 out of 5 by Matt D. from Great bag, especially for mirrorless cameras Love Domke bags, this is my 4th in about 12 years. Whats different about 'Ruggedwear' vs the traditional canvas that domke uses is it is a tighter knit, made to be used with the included wax to make the bag water repellant. The fabric is smaller thread, tighter weave. When properly treated, (more on that in a moment), the wax impregnates into the cotton fibers to give an 'oil cloth' finish. This is a stylish bag that would go perfectly with your British Barbour coat! This bag will hold 2 bodies and 3 lenses with room to spare. The padding is very good and there are 2 large interior pockets with one of them divided for a total of 3 good sized interior pockets, 2 large pockets on either side with velcro closing flaps, 1 large pocket in the front and a notebook pocket in the rear. About treating, this will take you about an hour to do properly, while the bag comes waxed, I like to give it a heavier coating for longer protection against mist, spray or rain. Apply was (included) with a clean rag rubbing into areas you'd like further protection. I treated the large top flap and the flaps on the end pockets. After applying, take a hair drier on full heat and go over where you've applied wax to work the wax into the fabric, get it to really soak in. I used about one third of the can to do this. Will the exterior back pocket fit an iPad? No. A Kindle Fire or Kindle reader, no problem, but an iPad won't fit in the F4-AF-Pro. You can get an iPad just right in the back slot pocket on the F-803 camera satchel which is wider (side to side) but thinner (front to back). The F-803 however will not fit a larger SLR with a battery grip.